The tour (booked with Imperial Junk and costing approx $100) began in Hanoi, where we got picked up bright and early (in my opinion) from our hostel at 8:00 am. The drive to Halong Bay took around four hours so at least I was able to catch up my hours usually spent sleeping! We arrived into the bay to dozens of tourists all scrambling to find their group leaders who were themselves scrambling to find their boat. We located ours and climbed aboard, to be met with a six course feast of a lunch. We set off on our sailing adventure, stuffing our faces while gazing out the windows and listened to the itinerary of what was to come; biking, swimming, caving, trekking, kayaking, you name it and we were going to do it. After lunch we had some time to relax, climb up to the top deck and enjoy the views from the comfort of our reclining sunbeds. We enjoyed this restful period for a few hours, passing through fishing villages and small mountains within a couple millimetres, until we anchored up and filed off board. We proceeded to explore the most magnificent cave I have ever been in. Tunnels, Stagmites, huge crevasses, numerous caverns- you name it and it was spectacular. After caving we climbed into our kayaks. We had about 40 mintues on the water, just before the sun set, and had a great time taking pictures, exploring small caves, and trying to avoid bumping into other kayaks. After all the excitement we had some time to refresh (showers etc) and then enjoyed a cocktail on the upper deck to the background of the setting sun. We were served another feast of a dinner (eight courses this time, served on large plates to be divided between tables of six) and then the evening was ours to enjoy. Our somewhat calm, older group (we were kinda hoping for a party boat..) collected on the back deck around a central table and couches and proceeded to have a lovely night including more cocktails and great conversation. Screw the party boat! I climbed into bed (In our superior room might i add- with a beautiful view of the bay) and fell contently asleep. Breakfast was served bright and early again (8am), which was slightly dissapointing after the scrumptious meals the day before, before we set off on another couple hours sailing. We arrived into Cat Ba Island where we disembarked and climbed onto rusty bicycles which took us through sprawling countryside, small villages, and waterbuffalo traffic jams. We cycled back the way we came and got on board the boat just in time for lunch (another feast) as we sailed towards Monkey Island. We arrived into white sandy beaches, blue water, and a stunning view of the bay. 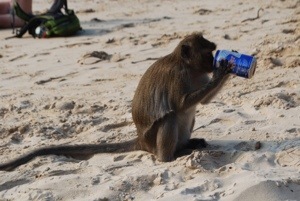 And- one monkey! There was a small trek our guide told us, which if completed would reward you with stunning views of the island. Well- they certainly didn’t warn us about the steepness of the hike! At one point I was literally clasping onto jagged rocks trying to heave myself up vertically! I climbed up three quarters of the way, took a few quick pictures and treaded carefully down. The boat sailed us back to Cat Ba island where we checked into our beach bungalow- thats right- beach bungalow. We ate, we drank, we met some more cool people, great conversations (mostly about the European economy- since when did I grow up and socialize with people who talk about economics!?) and freaked out and took pictures of all sorts of creepy crawlies that were lurking around us ( ie praying mantis’ and millipiedes). It was a great night. The next morning was not. Hungover and hungry we had just enough time to pack our bags and grab two bites of our breakfast ( I swear our guide told us breakfast was at 8 not 7) before we had to board the boat again to bring us home. Then it started to pour. And I mean POUR! we had to sit inside the rest of the morning and watch the rain droplets create ripples in the water outside. It was actually pretty awesome. The whole trip, in fact, was pretty awesome. Definitely highly recommended. One of the most beautiful places I have ever been. 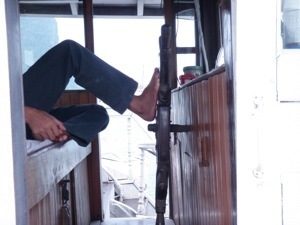 The Captain even steered the boat with his feet. What’s more awesome than that? That boat trip sounds amazing!! thanks for reading! it was soo beautiful:) hopefully skype again soon ok!